Since SIPs are a type of wood based construction, like any wood based construction, the single greatest concern with SIPs is potential damage from water exposure. In this regard, SIPs should be treated similarly to wood frame construction where OSB is used as an exterior sheathing. Like any wood product when exposed to moisture, OSB is susceptible to mold, rot and mildew. The moisture can come from inside the structure as humidity or outside the structure as rain, mist or condensation. To eliminate these problems, the OSB must be kept dry and/or allowed to dry when it gets wet. Outside: To keep the outside of the SIPs dry a few strategies must be employed. A drain plain, such as 30# building felt, should be installed behind any siding or roofing. All penetrations must be properly flashed and sealed. 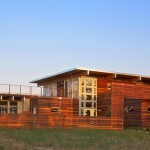 Any time wood, or fiber-cement siding is used over the OSB, it must be back and end-primed. In addition to these precautions, some climates may require use of a vent space between the siding roofing and the exterior OSB skin of the SIP. Inside: Controlling moisture from the inside of the structure is just as important. To keep the OSB dry, the following strategies must be employed. During construction, care must be taken to thoroughly seal all panel joints. This is done with expanding-foam sealant, mastic type construction sealant, and vapor barrier tape designed to adhere to OSB. Exhaust fans must be used in any higher humidity area such as kitchens and bathrooms. 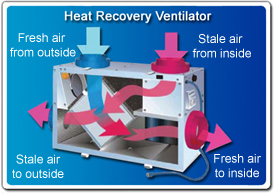 Also, using an Energy Recovery Ventilator or Heat Recovery Ventilator is recommended. These units expel moist and stale air and bring in fresh air and in cool climates they keep interior humidity from becoming higher than outdoor humidity. One very common area to find rot in any wood frame building is where an exterior deck meets the wall of a structure. These areas are penetrated with fasteners, are difficult to seal, and are subject to water falling from the roof and then splashing up off the deck onto the walls of the building. The best solution for this problem is to build the deck to be free-standing and not attached to the building at all. Also, keep a 1”-wide space between the building and the deck to allow for drying and drainage. Keeping the deck surface one step lower than the surface of the interior of the building is also a good idea. This keeps snow or water from migrating under a door, and reduces other possible water entry problems. Timber frame and log buildings tend to expand and contract with moisture, sometimes in dramatic amounts. Some of the details shown on this website may need to be modified when SIPs are installed over log walls, or over a timber frame. There are books about timber frame construction that show good details dealing with this issue. See www.tfguild.org; this website is a good resource for timber framers.